Standing tall on the lakeshore, its steeply pointed roof and angled deck resembling the prow of a ship, the Blue Ridge mountain cabin rental Southern Comfort offers you two vacation destinations in one: a magnificent mountain retreat and an aquatic playground that boating, fishing and swimming enthusiasts will love. Located on Lake Blue Ridge near Morganton boat launch, this lovely lakefront property comes with its own double-decker dock with boat slip below and lounging area above with umbrella-shaded table, chairs and lounges. If you settle in there or on the cabin’s double deck, you’ll be treated to a magnificent year-round view. Sunsets are especially incredible, with the sun shining on the lake as it dips behind the mountains. Southern Comfort has an all-wood interior, cooled by ceiling fans in every room and is designed with an open plan on the main level, with floor to vaulted ceiling windows facing the lake that optimize the spectacular view. You’ll find a mix of comfortable leather and rustic log furniture, stone gas fireplace, and such unique touches as an antler chandelier and table base, saddle bar stools, a rowboat bookcase, and a custom stone hood over the kitchen stove. The kitchen also features stainless steel electric appliances, maple cabinets and countertops, a crockpot, and a coffeemaker, with seating for six at the dining table and two at the breakfast bar. When you want to dine outside, just fire up the gas grill, located on the covered deck on the main level. There’s also a screened-in porch on the lower level, with a gas fire pit, so don’t forget the marshmallows! Southern Comfort has a game room with 60” DVD-equipped TV, board games, and books, and three cozy, comfortable bedrooms, all with handsome log furniture. The upstairs master suite has a vaulted ceiling, 32” Smart TV, walk-in closet, and bathroom with double sinks and Jacuzzi tub. The main level bedroom has a queen bed and 32” Smart TV, and a separate bath with walk-in shower, and the downstairs bedroom has a pair of twin beds. The adjacent bathroom has double sinks and a double size shower with dual showerheads. All bathrooms have wood cabinets and countertops, and hair dryers. Other amenities include WiFi, cable TV, washer/dryer, and a paved driveway. 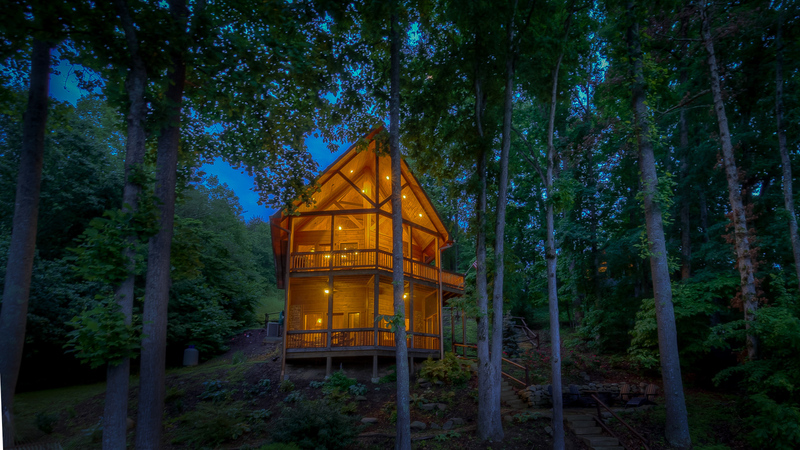 The cabin is just six miles from downtown Blue Ridge. 07/18 - We really enjoyed our stay at the Southern Comfort Cabin. The house has an amazing view of the lake! The lower level was fantastic for the kids. We will definitely return to Southern Comfort Cabin!! The house was well stocked and clean. The staff was very accommodating and friendly.